Coproduction: Montpellier Dance Festival, Théâtre Le Vivat scène conventionnée Armentières, Théâtres de Sète Scène Nationale, Dock 11 Berlin. Choreographer Michèle Murray has perhaps signed one of the most extraordinary creations of the year. Jean Marc Douillard / L’Hérault du Jour / Montpellier / June 27 2003 / Right up to the end: Vladivostok. This piece is full of beauty. As always in Michèle Murray’s work, this is an artistic interest in detail and the programmed impossibility for the audience of witnessing all at once. The naked eye cannot follow everything happening on stage, for though it is happening slowly, we find ourselves in total mental confusion. This is a stimulating and salutary work. Jean Marc Douillard / L’Hérault du Jour / Montpellier / June 2004 / The « Murray touch » means virtuoso dancers and provocative performers. This work is like a cold fusion, a slow combustion. The performers morph into motionless mutants, drug addicts without withdrawal symptoms; and nonchalant prostitutes. The performance is very powerful and can be seen many times without boredom. And even with a certain addiction. Could Vladivostok be a performance about drugs? We are not far from thinking it! Metaphors and metamorphosis : A sound space inhabited by the continual pulsation of Fatboy Slim and Chemical Brothers, a stage space filled with clothes, wigs and masks – and seven performers exchanging these attributes among themselves. A constant playful transformation is at work, a contamination, a combination and perpetual variations on the subject of double, sameness and difference, identity and gender. Who is who? Who is going where? What do we become? A final fray, a stripping so as to shed a new light on the former attitudes. 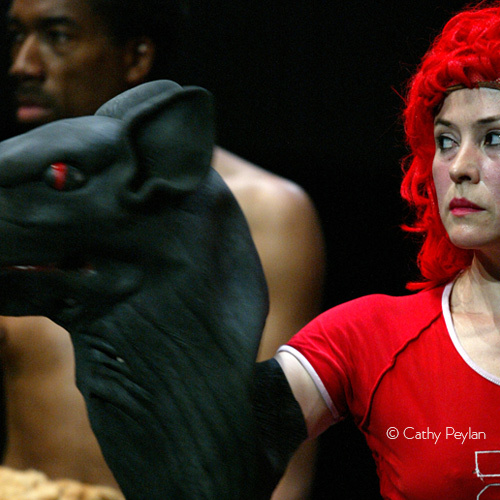 Jennie Klein / Ohio University /National Review of Live Art Glasgow / 2005 / Lone Twin, Michele Murray, and Jerome Bel: Many of the best and most exciting performances at the NRLA were choreographed actions that required an arena for action that the audience did not breach. With the crowds and long queues, it was almost impossible to see everything, but what I did manage to see was well worth it…. Michele Murrays Vladivostok, a dance of changing identities and movements through the donning and doffing of clothing, wigs, masks, and accessories named after the Russian city that is the last stop on the Trans-Siberian railway.